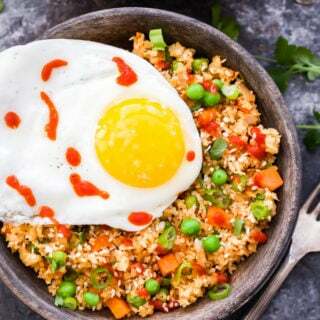 Thanks to USA Pulses & Pulse Canada for sponsoring this post. As always all opinions are my own. As usual, just when I was getting used to wearing shorts again and loving every minute of the warm, sunny, 70 degree days, mother nature reminds me that this is Colorado and the cold and snow can pop up at any time between now and the end of May. Well, it’s popping up for the next couple weeks. Goodbye 70 degree days and hello 40’s and 50’s with multiple chances of rain and snow. 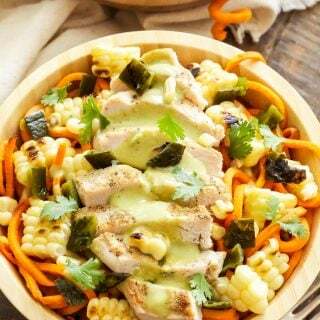 I’ve been cooking up lots of light spring recipes, making salads galore and grilling on the weekends. We even ate outside on the deck a couple nights. 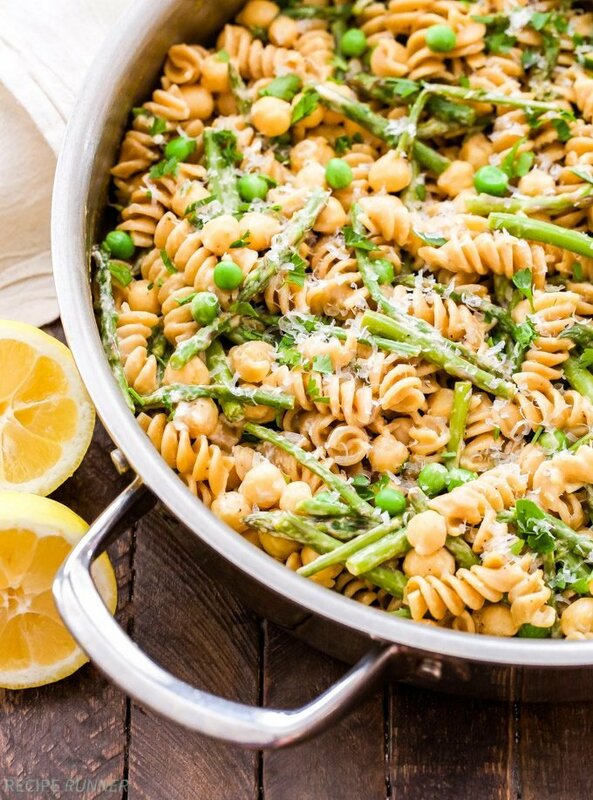 For the next couple weeks though, I think we’ll stay inside and I’ll ditch the cold, refreshing salads for comfort food like this One Pot Creamy Lemon Goat Cheese Pasta with Chickpeas and Asparagus. This one pot pasta dinner is my way of transitioning to spring eating, but still accepting the fact that I’m going to need some cozy comfort food. 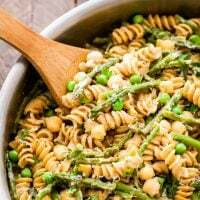 The lemon and asparagus are without a doubt the spring stars in this meal, while the chickpeas and whole wheat pasta keep it on the hearty side for those cold days that occasionally pop up. Back in December I partnered with USA Pulses and Pulse Canada to help spread the word about how important adding pulses to your diet is. Not only are pulses an easy way to add nutritious protein and fiber to your meals, but they’re also extremely affordable and sustainable. With the growing concern about how we can reduce our carbon footprint, adding plant protein to your meals a couple times a week is a great way to start and a delicious way to do it as well! You all went crazy for this One Pot Cheese Mexican Lentils, Black Beans and Rice that I made back in December and I can’t say I blame you, it’s one of my favorites! I figured I’d continue the one pot trend, because it’s hard to say no to a quick, easy to make, healthy dinner and one that leaves you with minimal dishes to wash afterwards! 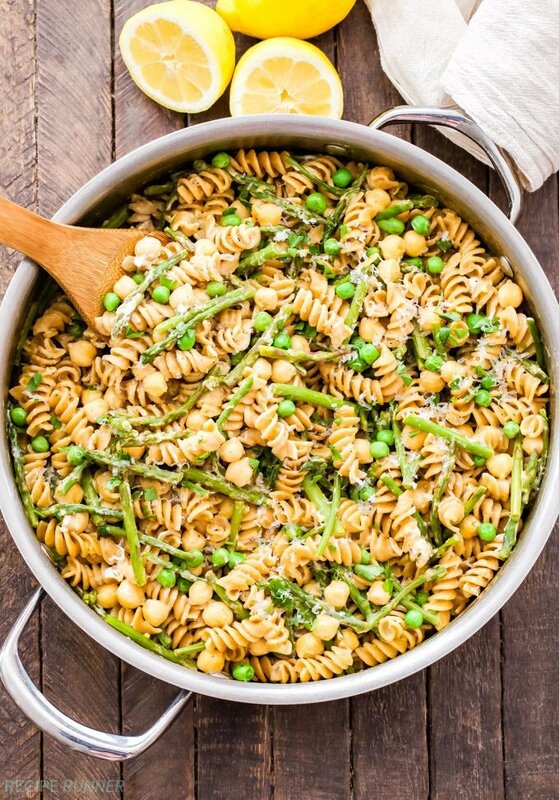 This one pot pasta wonder is loaded with whole wheat pasta, fresh asparagus, hearty chickpeas, sweet green peas, plenty of lemon, parmesan cheese and creamy goat cheese to bring it all together. 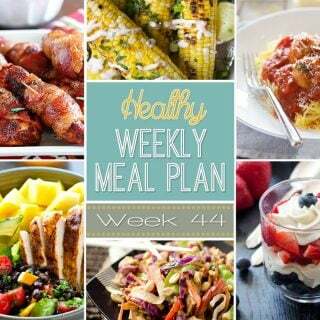 This vegetarian dinner is perfect for meatless Monday or any day you need a healthy, hearty comfort food dinner. It can also easily be made gluten-free by subbing gluten-free pasta for the whole wheat pasta. Grab the recipe below and get your daily dose of pulses, promise you won’t miss the meat! 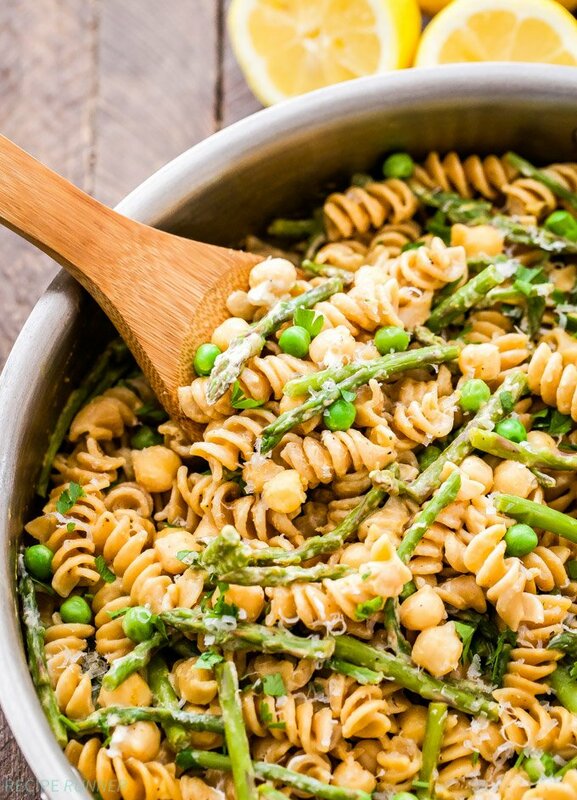 One Pot Creamy Lemon Goat Cheese Pasta with Chickpeas and Asparagus is the perfect healthy, vegetarian, comfort food dinner for weeknights! Heat the olive oil in a 12 inch lidded pan or skillet over medium-high heat. Add the garlic and sauté 30 seconds then add in the broth and water and stir together. Season with salt and pepper to taste and bring to a boil. Add in the pasta and stir. Cover the pan with a lid and boil until fairly tender, stirring occasionally, about 8 - 9 minutes. Add the asparagus and chickpeas over top without stirring then cover with the lid and allow to boil 4 - 5 minutes longer until asparagus and pasta are tender. There should be a little broth/water left after it's finished cooking, this will become part of the sauce. If needed, add more broth. Add in the goat cheese, parmesan cheese, lemon zest and lemon juice, stirring until melted and creamy. Stir in the frozen peas then remove from heat, cover and let rest a few minutes allowing the sauce to thicken slightly. Serve warm. 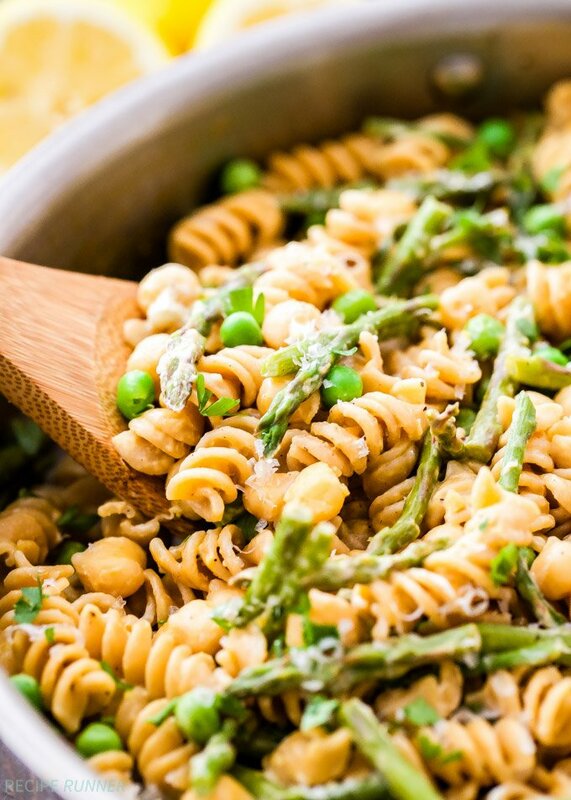 *To make this recipe gluten-free simply replace the whole wheat pasta with gluten-free pasta. This was SO good! My first time making a one pot pasta meal and it did not disappoint! My husband loved it as well! This will be a repeat in our house! Aren't one pot pasta meals the best?! It's hard to go back to cooking pasta the traditional way once you've discovered this method. Glad to hear you and your husband enjoyed it! Absolutely awesome! Made this for the first time tonight and it worked flawlessly. I used Banza chickpea pasta and only cooked the pasta at first for 5 minutes. The asparagus was perfectly tender - I wasn’t sure it’d cook through. Have already recommended to veggie friends. This will be a repeat!